When an auto manufacturer skips a year of production, one of two things can happen: The vehicle may be going away for good or it will emerge a year later with significant changes. The latter of the two is what happened to the Hyundai Veloster, which skipped a production year in 2018 and has been revised with a variety of changes to the 2019 model. There’s little doubt that the root of the problem was Veloster sales dipping from roughly 30,000 in 2016 to around 12,600 in 2017. Obviously something needed to be done. The redesign for this somewhat quirky three-door hatchback includes some exterior changes and slight alterations to the interior. The front-wheel drive 2019 Hyundai Veloster has an optional turbo engine – a 1.6-liter, four cylinder that generates 201 horsepower and 195 pound-feet of torque. It goes 0-60 mph in 6.2 seconds, but feels even faster. The 2019 Hyundai Veloster also features increased performance and a revised suspension that reportedly will provide better comfort and improved handling. The first thing that traditionally has drawn attention regarding the Veloster is the odd door arrangement. It’s an ingenious idea, putting two doors on the passenger side of this compact hatchback so that no one has to be inconvenienced getting in and out of the back seat. Most vehicles with a long and low profile like the Veloster are coups. But the two doors on the passenger side gives it a unique appearance. And since it is a hatchback, the Veloster actually has four doors and seats four people. The 2019 model still maintains the sloping roofline, but now has a more prominent grille, narrower headlights, a deeper front fascia, and a flared rear fender. The interior changes are much less dramatic. At first glance, the 2019 Hyundai Veloster appears sporty. And that’s the case if one has the turbocharged model, a peppy engine that makes the front-wheel drive Veloster fun to drive. The turbo engine remains unchanged – 1.6-liter, four cylinder that generates 201 horsepower and 195 pound-feet of torque. It goes 0-60 mph in 6.2 seconds, but feels even faster. The gas mileage is fairly good at 26-33 mpg. The standard Veloster engine was a bit pokey two years ago. The upgraded engine is a 2.0-liter, four cylinder that produces 147 horsepower and 132 pound-feet of torque. It’s not nearly as quick as the turbo model and only gets slightly better gas mileage (27-34 mpg). Both engines come standard with a six-speed manual transmission. The base engine can be paired with a six-speed automatic and the turbo to a seven-speed, dual-clutch automatic transmission. As mentioned, the turbo has some athletic get-up-and-go and the handling is pretty good overall. The Veloster has good road response and handles tight turns adroitly. Interior space remains unchanged. The seating is comfortable overall and leg room is not a problem for anyone. Due to the sloping roof, the issue is head room if you stand 6-foot or taller. A deep trunk provides 19.9 cubic feet of cargo space and nearly doubles with the back seats folded down. The interior has what Hyundai calls the Kona, a 7.0-inch display that is standard. Available as an option is an 8.0-inch display. All five Veloster trim models have standard forward collision mitigation, lane keeping assist, and allow for Apple CarPlay and Android Auto. The Hyundai Veloster is an unconventional compact hatchback with the three doors. 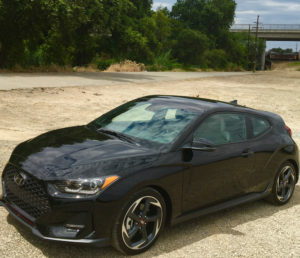 We like the idea and feel the Veloster is a solid choice in its class, especially when choosing the turbocharged engine that makes the car fun to drive.